These are a woman’s winter boots, made from the brown leg skins and white belly fur of caribou or reindeer (domesticated caribou). The tassels and decorative bands are made of mink, otter, and wolverine fur. Elders said that they must have come from a village along the Kuskokwim River, where boots were fancier than on the coast. Neva Rivers: Yes. We wore these all the time, year-round. Neva Rivers: But in the summertime, we barely used these. We usually went barefoot. Except we used short little boots in summertime. Mostly we used these [tall caribou boots] for warmth. Neva Rivers: Men’s boots are larger than women’s. John Phillip, Sr.: Qaralingqessiyaayuitut angutet. Arnat taugaam qaraliliilarait. Joan Hamilton: Men didn’t have these (indicates tassels). John Phillip, Sr.: Augkut taugaam ciuqalit kingiita piqalarait. Wangkuta nunamteni tua-i qaraliliyuilkait angutet. Neva Rivers: You can tell the difference by the way they make it. Hooper Bay people have their have their own way of making their things. Families have their own designs. And a family will have their own [way to] deck up all their clothes using what they have, in their own style, not picked up from different places. We all have marks on our parkas, all the villages. We can tell that those [boots], because they have this kind of fancy [decoration], are from the Kuskokwim area. At Hooper Bay, we don’t have that much decoration, only in the front of the seal boots. It is easy to tell that these boots are from the Kuskokwim area. Neva Rivers: Tuntum iruit [leg of reindeer]. These [upper parts of the boots] are made from reindeer, the hind and front legs. John Phillip, Sr.: The one here [front of upper part], that’s the back leg, a reindeer’s back leg. That one’s the front [back of upper], because they put it in back. Tuaten pilugkiulallruama-ll’ wiinga nallunritaaqa [since I had that kind of skin boots I know about them]. Mink, otter. Joan Hamilton: These [tassels] are mink, this is mink [dark band near top of boot] and this [trim at very top] is otter. Una-mi [what about this]? (It [fur down back seam of upper] is a piece of wolverine. John Phillip, Sr.: That’s terikaniaq [wolverine]. John Phillip, Sr.: That white kind, yes. Joan Hamilton: This [light-colored skin at top of upper] is the same animal [caribou or reindeer], but there are parts of its skin that are white. John Phillip, Sr.: Wolverine-augguq mana. Joan Hamilton: He said wolverine right here [indicates top of upper]. Cakluku [what is it used for]? John Phillip, Sr.: These are from upriver, somewhere upriver [the Kuskokwim]. Neva Rivers: Yes, it’s not like the way we make [boot soles]. John Phillip, Sr.: Tua-r tamana tuntuvauciqellria wani. Neva Rivers: Thicker one for the soles. John Phillip, Sr.: Maniatuut moose. Taukut-llu sealskin-atunayuqenritut. Joan Hamilton: You need a tough skin for the soles, so they probably used moose, that’s tougher hide. For this part [boot upper], you don’t need as thick as this [sole]. After they make all these pleats [at the toe], they sew on each [pleat] with a stitch, these outer ones, to keep it shaped up like that, and all the way in the back [pleats at heel]. After they are done with sewing it, they sew up all those pleats to keep them together in its shape (indicates shape of entire boot) all the time. And those are sewn with sinew thread, all of those. John Phillip, Sr.: Teguaruuq, teguaq. Neva Rivers: Ukut-llu cuqluki. Ukut-llu pirraarluku uumeng cuqlirluteng. Aron Crowell: Did people use a special tool for doing that? Neva Rivers: These [sole and upper] have the measurements for a girl. They measured with their hands to see how much they’re going to use. And they have the shape of the sole part, and they make it like round oval. And they measured with their hands. To make it fit to here [length of sole] for the size of a girl or boy or any other. And in here [toe], after they put it, they measure it good, and they put more in here [toe] and they measure it. They sewed from here [instep], and put this little loop in here [sole edge one third away from the toe], and then from here [from loop to toe]. They measured with their hands [width of the sole], so they can be even, nice and straight when it’s done. It won’t be crooked like that [twisted sole]. So they have to be watchful. Aron Crowell: When you’re making the sole, how do you measure it with your hands? Neva Rivers: Measure it up like this way [from tip of thumb to tip of extended middle finger]. It could be this way for the adults. For the men’s, they always use it loose, not tight. It has to be roomy for the ones who travel out. Aron Crowell: Is that a strap to make it tighter [around the bottom]? Virginia Minock: To keep it on so it doesn’t slip off. Joan Hamilton: Like a shoelace. Neva Rivers: And they could stuff it with grass. Long time ago, they use that. And they put extra grass underneath in here to make an insole. And they put that thing [boot-liner] to keep it warm and they make it roomy, so the feet can move around. On cold days they use that kind. And this is very number one, because it’s got thick hair on here [upper], and the feet will not be cold. And it will last longer. Keep it dry like that too. When it gets wet, you put grass inside. Shape it up like this [twisted] and you stuff it in here, instead of paper. Keep its shape all the time. Virginia Minock: But it’s got to be a certain kind of grass. Neva Rivers: Yes, they’re all different. Some kinds are to keep the feet warm. There’s a lot of different grasses. Grass that we use it for any—we use it for the bedding, they used it long time ago, for the door, to keep the door closed. They used it for under the mud when they make a house, they put grass. 1. Qavciq is the word for “wolverine” in the Hooper-Bay Chevak dialect (Jacobson 1984). 2. A meqciraq—singular of meqcirat—is a “skin soaked so that the hair will come off,” a process often referred to as “aging” a skin. The base meqcir- means “to soak a skin so that hair can be removed easily” (Jacobson 1984). 3. A teguaq—singular of teguat—is a “crimp in the sole of a skin boot.” A teguarun is a “device for crimping boot soles” (Jacobson 1984). 4. A kegginalek is a “woman’s semi-lunar knife” in the Hooper Bay-Chevak dialect. In other areas, uluaq is the Yup’ik word for it. This type of knife is also called ulu in English, which is the Iñupiaq word for it (Jacobson 1984). For winter travel and work outdoors, Yup’ik residents of southwestern Alaska wore warm, knee-high boots made from caribou, moose, or seal skins. 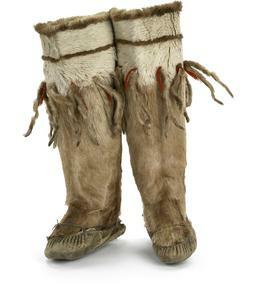 (1) In summer, they wore short fur boots, or waterproof ones made of seal skin. Caribou boots often combine white belly and brown leg sections of the animal’s hide to make attractive patterns. Other kinds of furs—otter, wolverine, beaver, mink—make up decorative bands, seams, and tassels. (2) Grass or fur socks were worn inside, with grass padding below the foot for extra insulation. Tough maklak [bearded seal] hide was often used to make the soles. In the past, bearded seal soles and skins were widely traded and given as gifts during feasts. (3) This pair of 19th century boots, which Elders identified as a style typical of villages along the Kuskokwim River, has caribou or moosehide soles, possibly because bearded seal from the coast was not available.